One might think that after three previous visits to Paros, Greece, Study Abroad students and their mentors wouldn’t discover anything unique to film or anyone new to interview, but one would be wrong. Once again, their work is as prolific and surprising as the island of Paros is picturesque and serene. 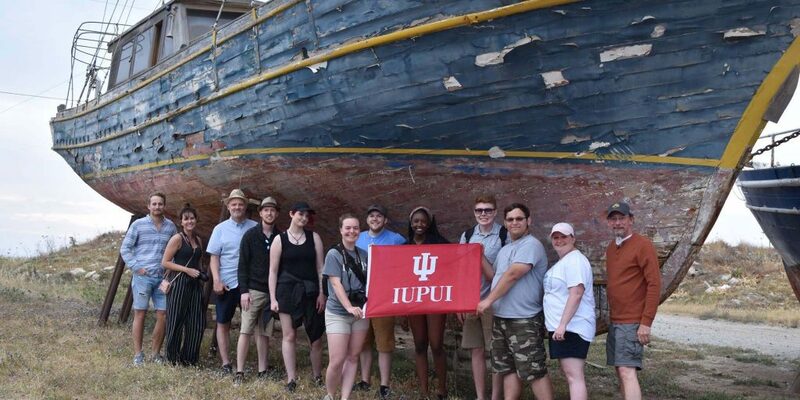 Albert William and Thomas Lewis, both lecturers in media arts and science at the IU School of Informatics and Computing at IUPUI, accompanied ten students on this seventh trip to Greece, and the fourth visit to the island of Paros. William blogged about the lessons that Paros has taught him and the group. “It is always a learning experience—from all of the small interactions with the warm, friendly people, to the many places I discover every year. I also see our students increase their awareness and their wisdom based on what they’ve learned here on the island in the same way,” he wrote. Students and faculty explored Paros Park, the Environmental and Cultural Park of Paros, on this trip. Paros Park spans an 800-acre peninsula with great geological and historical importance, and welcomes visitors year-round. The group also documented farming practices on the small Mediterranean island. Agriculture is approached a bit differently there and has an impact on islanders and tourists alike. 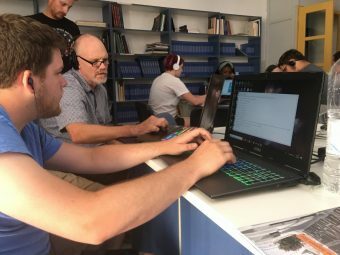 The students used a Matterport camera, a first for the Paros study abroad visit, and captured a variety of 3-D spaces, including an archeological museum, a church baptistery, and a pottery workshop. The island visitors also recorded interviews with residents of Paros—and found some unexpected stories. Alcey Childers spoke with local tour guide Avgi Kalogianni, Matt Marret learned about the craft of traditional Greek shoemaking, Renee Cook discussed contemporary ceramics with artisan Stelios Ghikas, and Jack Salazar met—wait for it—former Olympic snow skier Sophia Mystrioti. Those interested in learning more about the Greece Study Abroad program can read their blog or visit their Facebook page. Callouts for next summer begin in October. Find the details on the School of Informatics and Computing Study Abroad webpage.